Images are something that we all need to use, for a variety of reasons and places. For example, we share pictures on social media to help increase our engagement for our business, we write blogs for our website, we create brochures, logos or other marketing material and the like. Those pictures or images can make a huge impact on your business – positive and negative. What I mean is that it’s pretty positive that we need them because consumers are visual and using images for our business can positively affect our business. 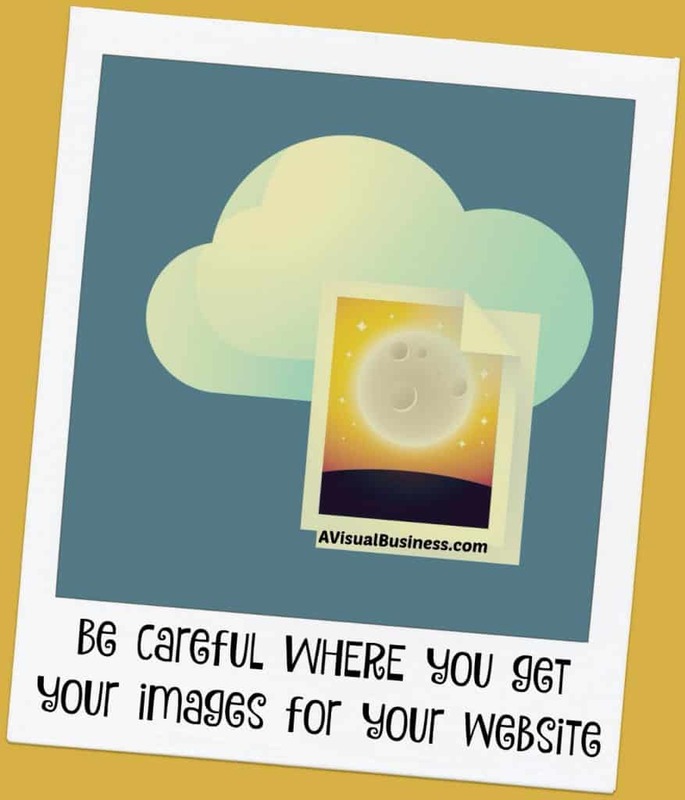 On the other side of that, if you use images that belong to someone else on your website, marketing material and maybe even social media that it can cost you big time and that is not something you are going to want to have to deal with – negative! If you are taking it to Google, like most of us do for a variety of reasons, I urge you to reconsider when you are looking for images for your business. Google is an info warehouse and isn’t meant to be a free source for your images. If they are on there, don’t think they are ‘free game’ to use. Google isn’t required to show attribution because they aren’t claiming it for their own, they are just providing images, websites, blogs, etc based on the search that you entered, and the type of search you entered. If you are just sharing them on social media, you are in a better position but there is still no guarantee that the owner doesn’t ask you to take them down and or seek financial retribution from you. Further, it could be helpful to check out the terms and conditions for the social media you have found the image on, for how they state images found on social media are deemed. Usually folks post images on social media that they took from others, add a meme, or something and just regurgitate it so it is usually hard to determine where the image originate, but always consider that ignorance isn’t an excuse. I am clearly not an attorney so how you decide to use images on social media is up to you. I typically believe that if I share something on social media, for the majority of the time, I am not claiming it as my own and only sharing it. So, I personally don’t worry about it as much… however, this will have to be upon you and what risk you are willing to take for you and your business. If they have attribution on them, this doesn’t give you the rights to do whatever you want with it either. And even in the same situation as above, posting on social media, that’s going to depend on you and your risk level. I will add though, however, that if there is a link attribution or quoted author or the like and you crop it off and try to pass it off as your own, you are crossing a slippery slope in doing so. With that being said, when you create images, be sure you are putting your link, url or logo on the images. Anything that use for your business branding to assist you in making money for your business, I would highly recommend purchasing images. There are many websites that you can purchase images from such as Adobe, Stock Unlimited (my current fav, price and quality), Graphic Stock and they have their own internal search feature for you to seek out images that you need. Further, I would recommend checking out their terms and conditions and how they allow users to buy, use and what types of licenses they have for which images. While you are there, download those terms and/or their creative license to store with your images you download. This is on you to do your due diligence for your business. I had a friend who innocently used an image on her website and had to pay a fine for using that image as well as taking it down. Concerned, she took that one down and many others then had to replace them. So, don’t create more issues for you and your business by having to pay fines as well as more work correcting issues that shouldn’t have happened in the first place. Images help tell a story to explain what you have in writing to better define the point you are trying to get across. 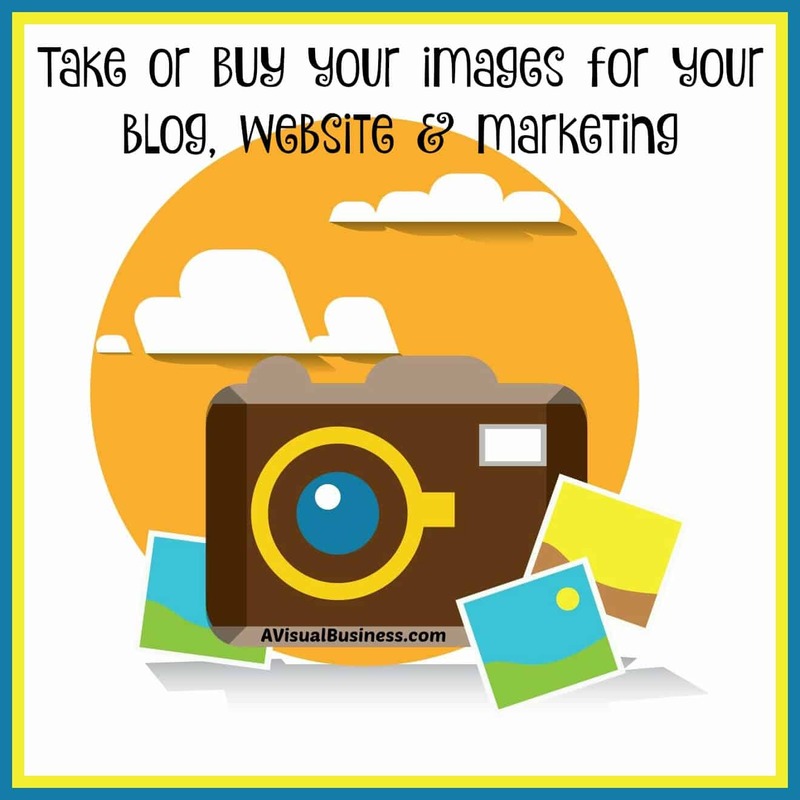 So, please, take the extra time to find images that will work for your business but be sure you are using images that you have the rights to use. Should you have any questions on images, the links to images sites that I have mentioned, please contact me and I’ll be happy to assist. Please note that some of the image links above are affiliate links which means that if you purchase packages, images or subscriptions that I will be compensated for sharing them with you. However, please know that I would never recommend a service or product that I haven’t used, don’t use or find to be run poorly. Feel free to comment below about any image sites you use with links to help others. Great information on sharing images. I prefer to make my own images and share on social media. But, if I do share an image from another company’s Facebook Page (for example), I will include their link back to their site or their Facebook page. I also recommend this to my clients. I agree small businesses should be careful when sharing images. No one wants to get into trouble. We have been doing some interesting strategy on Pinterest that has me checking sources. OMG. Pins that go nowhere. Pins from Flicker where it clearly says may have copyright issues. For FB and twitter, we tend to make our own, which we like doing, but there is much confusion and not giving attrition out there. Great post, Kristen, about images. This has been a sore issue with a lot of people. You’re the first I’ve seen to address the issue of sharing on social media and Pinterest pins. In my newsletter, if I’m curating someone else’s material I always post an image that I’ve vetted and not the one associated with the article. Well I am glad to bring a much needed topic to surface, thank you for saying that Joyce. I actually learned this the hard way, Kristen! When I first started using images, I didn’t know this. Thank goodness my seo folks did! Now I purchase mine, and they aren’t expensive. Whew! There are some great places to get many images and NOT pay up the rear for them… sorry you had to learn the hard way Susan.. .but glad you are on top of it now. Great advice Kristen and something a lot of people don’t think about. I usually try and use my own images (though my photography skills are atrocious) or build an image using Canva, so I can avoid the confusion about attribution. I would hate to get a fine. All the images used in my branding…from my book to my website, were purchased from IStock I believe and my designer throughly checked the license before we bought them. I use a lot of my own photos for the posts I do and also my FB and Twitter graphics with quotes. I also use Pixabay a lot. They have fabulous images, they are all creative commons and most of them do not want attribution. I do contribute to the creative commons pool by giving money to the photographers. My understanding is Pixabay shares it based on popularity and downloads. I remember the days when I unknowingly did think that finding an image on Google, meant you could use it. I do know better and funnily, I found one of my images there now when I was searching a specific quote to use again. It’s great to bring all this info to the possibly uninformed, Kristen. Especially as the online world is becoming more and more visual oriented. Thanks! Why thank you very much Beverly and we all have to learn somehow, hopefully not with expensive repercussions though! Take this to heart my friends! I play by the rules, but made the mistake if using an image from the photopin site. All on me – I misinterpreted the Creative Commons license for the image. And a company that goes after folks on behalf of photographers contacted, made me aware of my mistake AND threatened litigation if I didn’t pay what amounted to a one time use fee (and it was not cheap). We went back and forth for several months but in the end I was advised to pay the fee and not risk court proceedings – ignorance is no excuse and all. Now I use my own photos and images when I can, or make damn sure I read the fine print. Tough lesson learned. That IS a very tough lesson Kim and I’m sorry you had to deal with that… lesson learned.. moving forward… thank you for sharing, for sure. I learned this lesson the hard way. On one of my older blogs I would grab images from anywhere…until I received a letter from Getty Images several years ago. They requested a large amount of money; however, we had coincidentally replaced that image already. I ignored the letter and, fortunately, I did not hear from them again. Wow Rachel, you got lucky then, good for you! Whew.. thanks for sharing that. I take a lot of my images, and I get some from Canva and Death to Stock Photos…I did use a celeb picture I got off google once, but I attributed it and put a link back to the original source… I hope it doesn’t come back to bite me! Good that you buy yours.. but just be careful with just attributing, unless you get explicit content, it is not free game. Hope it doesn’t come back to you Kimberly. I have seen this happen to a lot of people I know. Google is not the way to go about obtaining professional pictures for your business. You got that right Christy! For sure! Oh yes. Allow me to be your bad example. Many years ago, when I was just starting out and was young(er) and foolish, I picked up a terrific image on Google. Many years later, I got a letter in the mail from one of the big image powerhouses saying, in essence, “You used a copyrighted image for you own use and you owe us $500.” Talk about heart-attack city! As you mention, the photo has been used and shared and reshared to many times the origin was lost in the mists of time. I was able to negotiate that number down, but it was still an expense I could ill-afford. Since then, I’ve purchased images that I want to brand, and keep Google shares to an absolute minimum. You were Jackie, I just didn’t mention your name. lol But sadly you had to deal with that situation, but lesson learned, the hard way, unfortunately. I surely hope you do Joan, it will cost you more than the cost of a small membership elsewhere. Thanks for this great reminder on images. I love to take photos and use my own for most of my blog posts, but also have a couple of places that I get photos from. At first I tried to google, but realized quickly that most weren’t usable or the attribution info was hard to find, so I stopped. Photographers work hard to capture beautiful images. So glad you understand the value Karen. Great job! Kristen – Another little thing about purchasing the rights to an image is that the license to use it can be short-term or long term. I found out the hard way buying a short-term license to use a photo of a woman’s face for the cover of my book -I had the picture altered appropriately, and then went back to purchase a long-term license, only to find that it was then not available!! I had to start all over with a different book cover – lesson learned. I was looking for the same article topic on Search Engine, But I found you on Google+, Yes you are right, I am taking the pics from free licencing sites like – Pixabay etc. Is it secure to use their images for our blog post. and one more question is there any site from where we check the copyrighting images. I would just suggest buying your images from a picture site… or check the creative license for the sites you go to and use. I would never use/find images on Google… as you don’t know where they came from Harman. Thanks for asking. Thanks Kristen for sharing the guidelines about images selection. Generally, every blogger and newbie marketers save images from Google search engine. It is very important to select the image which is labeled for commercial use. You shared an amazing tips and value in this. Thanks for sharing valuable article with us. Hi Kristen, this is another golden post by your knowledge ocean. I learned few new things however I am a regular visitor to your blog. Every time I read the new post, it includes something new and attractive. I quickly bookmark your every post to take fresh ideas for my post. Keep up the tremendous job of sharing such posts! I plan to and thank you!